A few caveats are of course in order. Risk Sentiment Can Be Overridden: While forex pairs are heavily influenced by risk appetite, and that the right stock index will do a good job of representing that overall sentiment in given time frame, risk sentiment is just one of a number of forex trend drivers, it can be overridden by other market drivers. Also, a given index may not always accurately reflect how that sentiment is influencing a given pair. If a big multinational transaction is being closed, that can cause a short term spike up or down in the related currencies if one of the parties decides to convert a large block of currency. Or if Japanese companies are given a temporary tax break on repatriated profits earned abroad, the normally safe-haven JPY could spike higher even during a period when its fellow safe-haven currencies are falling and risk currencies are moving up. Therefore day these are less important to intraday traders who are in and out of positions within a matter of hours. In other words, over the course of weeks these amounts are not material compared to the roughly $5.3 trillion traded daily on forex exchanges. However they can be influential on a very short term basis, especially when unusual activity can set off a wave of computer-generated trades. That said, from the set of 4 hour charts we saw above (shown again here below), we can see that stock indexes in the same trading session or region show strong correlation. That boosts our confidence in them as short term risk sentiment barometers, as we’d expect them to be influenced by the same market drivers which in turn would shape risk sentiment. In other words, note how the US indexes on the left basically move together, as do the European indexes in the center column, as well as the Chinese indexes in the top and middle of the right column. The Nikkei, on the bottom right, more resembles the European indexes. That’s interesting because, as we discuss below, over the longer term the Nikkei’s overall trend for over the past year has more resembled those of the US and Europe than Chinese and other Asian indexes. We can speculate about reasons, but that would be beyond the scope and focus of this article. In sum, the evidence we’ve seen suggests that for shorter term (assuming you believe four hour charts are for shorter term trading), the chart of a stock index that is active when you’re trading can be a useful risk appetite barometer. Short version: While stock indexes are good risk sentiment indicators, we didn’t find any that were really useful for tracking forex trends over the long term. We could speculate on any number of reasons (central bank interventions distorting normal correlations, other factors overwhelming risk sentiment, etc.) but that would be well beyond the intended length and scope of this article. Here are the details for those interested (if not feel free to skip to the next section). First let’s look at how risk appetite as portrayed by the indexes looks on a longer term perspective by again viewing the weekly charts for these indexes. Not surprisingly, regional differences among major stock indexes matter less over the course of months than they do over a matter of days or weeks. The major market movers exert a broader influence over a longer period and drown out minor and short term local factors. The bigger, more lasting economic trends have time to exert themselves. The US, European, Japanese and Australian (not shown) indexes have been strongly correlated and have similar overall trends, albeit with some variations in timing. In other words, correlations in risk appetite as portrayed by these indexes go beyond regions or trading sessions and are shared by US, European, and some Asian markets. However Taiwan, Hong Kong, Korea (the Kospi – not shown) and Straits Times (Singapore – not shown) indexes have all been in a flat trading range for 2013 the same period. Again there we’ll avoid speculating on the reasons for the differences, and just note the difference in risk appetite as portrayed by the different regional indexes. The key point here is that while longer term investors or traders (those holding positions over this period shown above could theoretically use any of the US, European indexes for an overall picture of risk sentiment trends, – NONE WOULD HAVE HELPED MUCH TO PREDICT OR CONFIRM FOREX TRENDS over that period of Mid-July 2012 to October 2013. The set of weekly charts below compares the S&P 500 with the same set of risk sensitive pairs we used above to discuss short term risk correlations between stock indexes and forex pairs. Note how the weekly trends of the forex pairs either don’t correlate very well (in the case of the AUDJPY) with that of the S&P 500 or diverge (the others) for well over the past year. Other major pairs didn’t correlate any better over this period. Remember, we just established that the S&P 500 is a good representative of long term stock index trends and thus of overall risk appetite. We could have used any of the other US or European indexes shown above, perhaps those for Taiwan and Japan too, and gotten the same basic upward trend that suggested a period of risk appetite. It wouldn’t have mattered. None would have been useful for predicting or confirming these currency pair movements over a similar period. Fortunately there are other barometers of risk appetite that may correlate better with your particular mix of trading session, portfolio, time frame and holding period. We’ll cover these in coming articles. The above is far from an exhaustive study, so we look forward to comments from readers. That said, here’s what we’ve found. Most major stock indexes trend together over the long term. So if your anticipated holding periods of about a year or more, any of the indexes would do as an overall risk barometer. Therefore your ultimate choice of index would depend on which best matches your own investing or trading focus. For example, those more focused on smaller cap US stocks might prefer the Russell 2000. Those focused on technology might prefer the Nasdaq, and so on. Over the shorter term the trends of the big global indexes vary with regional trading sessions. Therefore traders with anticipated holding periods of less than a few days need to stick to the regional index that best correlates with their preferred trading instruments. For example, Asian commodity traders might want to consider monitoring an index of an Asian commodity producer of the commodities they trade. For those with holding periods of a few days or weeks, as shown in the four hour charts, a major stock index will help predict and confirm risk sentiment as its influencing currency pairs. Longer term weekly charts were not especially helpful in predicting currency pair movement. Remember that not only is risk sentiment just one of a number of key global market drivers, it is typically just a reflection of the combined effect and interplay of the real underlying trend drivers, such as actual and anticipated trends in interest rates, growth, employment, spending, economic policy, geopolitics etc. For example, as we discussed here in Part 2, arguably the key global market driver in the recent years of the Great Financial Crisis has been central bank policy and interventions. Unfortunately, it can take a lot of time and effort to follow Asian, European, and US markets each day and discern what’s been driving them. Just follow me. New to fxempire.com, I’ll be providing updates on what are prime forces moving most or all of the major global asset markets. Sometimes the updates will come daily, sometimes weekly. It all depends on what’s happening in the markets. Inter-market analysis is a huge topic, so this series is just to provide an overview so that you’re better able to pursue more in-depth study on your own. See here, and here for the rest of the articles . 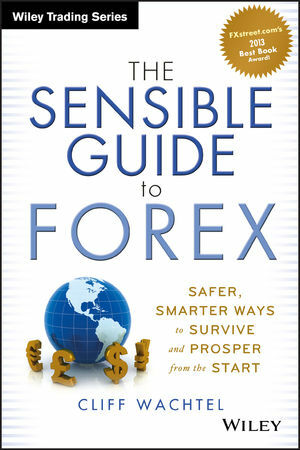 For more in-depth coverage of this topic, and all topics covered in this series on inter-market analysis, see The Sensible Guide To Forex: Safer, Smarter Ways to Survive and Prosper from the Start (Wiley 2012). You can view parts of it for free using the “Look Inside” feature here on the book’s amazon.com page. If you’re a forex trader or income investor seeking safer, higher returns, then this book is a must-read. It’s the only forex book specifically for those interested in safer, simpler ways to trade currencies (or other assets), or to build a currency-diversified income stream that will keep central bank currency debasers out of your pocket. The hardest thing about gaining expertise in trading or investing is finding the right guides that don’t waste and exhaust your time and money. I wrote this book because I couldn’t find that one book that would get me started on these topics. maintain the right attitudes towards successes and failures, both of which can destroy your trading career if you’re not prepared for them. In addition to the above, it shows you how to build an income stream that’s diversified into the currencies most likely to hold their long term value. DISCLOSURE/DISCLAIMER: The above is for informational purposes only and not intended to be specific trading advice. In other words if somehow you lose money based on the above I take no moral or legal responsibility for it. Deal with it.